Traditional Japanese Food – With there being over 500,000 restaurants (and growing every day), there is no shortage of food in Japan. Make sure you try out these 10 Foods we think you HAVE to eat when you come to Japan! Oh yeah, the Japanese characters are there purely in case there isn’t English around, and they are pronounced exactly the same as the English name next to them. If you recognize any of these on the streets, hop in and grab a bite to eat. When you hear “sushi” your mind probably immediately jumped to the imagery of a deep red piece of raw tuna or a savory piece of salmon over a small bite-sized portion of rice. Even for some, the word “sushi” might conjure up an image of a deep fried roll with sauce dripping all over it. Sushi isn’t always exclusive to fish and rice! Nikuzushi is meat sushi! A delicious piece of steak atop perfectly cooked rice. Those are the 2 main ingredients in nikuzushi and depending on where you go, you might find it comes with other ingredients. Generally, you can find salt and some kind of pickled vegetable (think relish) with it. It’s as simple as sushi but it has a truly deep flavor. You will find a lot of “don” type of dishes when you come to Japan. I might go as far to say it is the most common food in the country, it is definitely the most easily accessible. This is another relatively simple dish that has infinite possibilities. Gyu (meaning beef) and don (being a rice bowl) are the 2 ingredients required in this dish. Gyu don is often very filling and fairly cheap, you can find a wide variety of this kind of food. 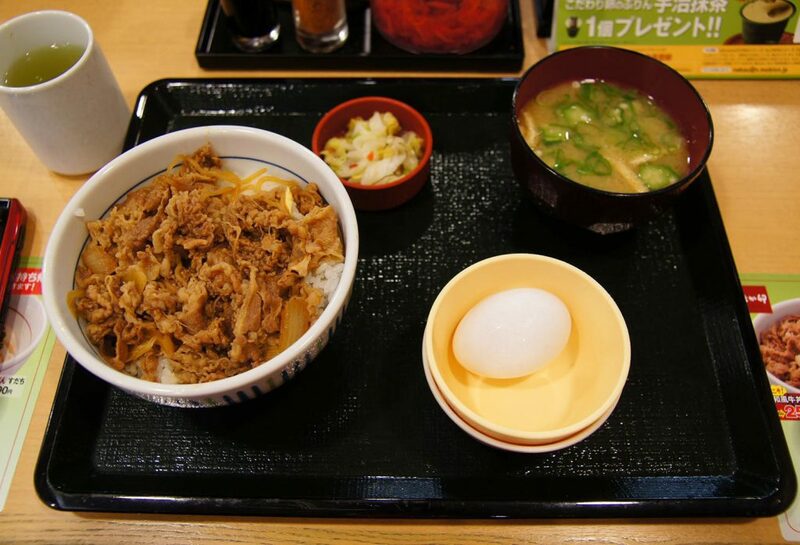 There are plenty of places that are dedicated to selling Gyu don, like, Matsuya and Sukiya. This dish usually comes with pickled ginger and miso soup! Quite the bang for your buck. Udon is a very thick wheat flour noodle served with a dark soy sauce broth. I find this broth slightly more sweet more than savory. This dish is served both hot and cold. Depending on where you are in Japan you will find regional versions of this dish. North, South, East, and Western Japan all have their own takes on this dish. 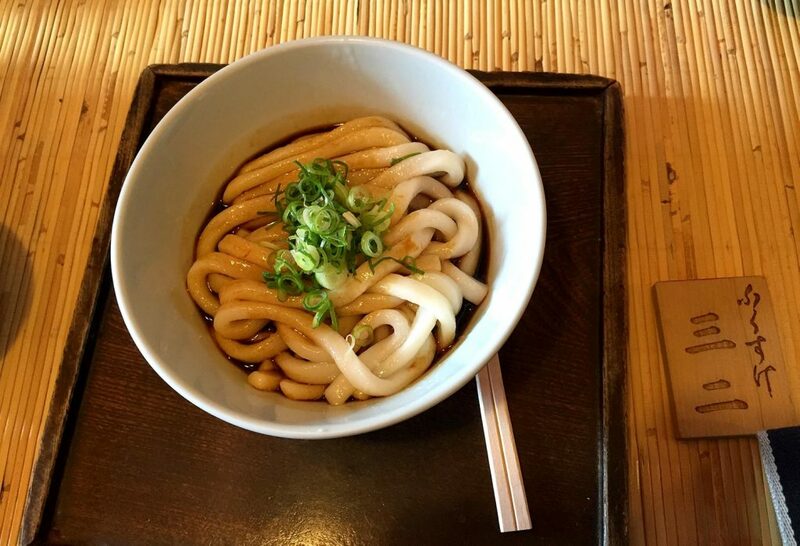 Within Udon, there are a bunch of styles, so it is recommended to try out a few, however, the most classic version of this dish is the Kake Udon. It is common to have some kind of tempura with this dish, I personally recommend the soft boiled tempura egg! 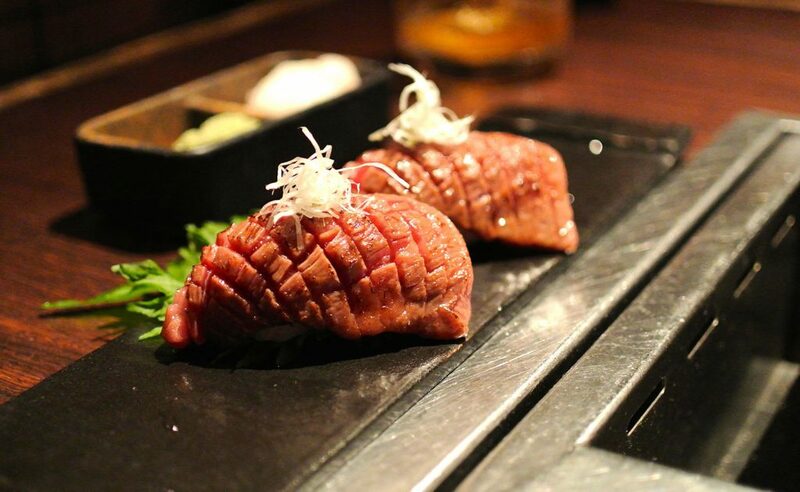 This dish is especially delicious after a late night of drinking at your favorite Izakaya! Of course, if you’re not into drinking, this food can be enjoyed by anyone. 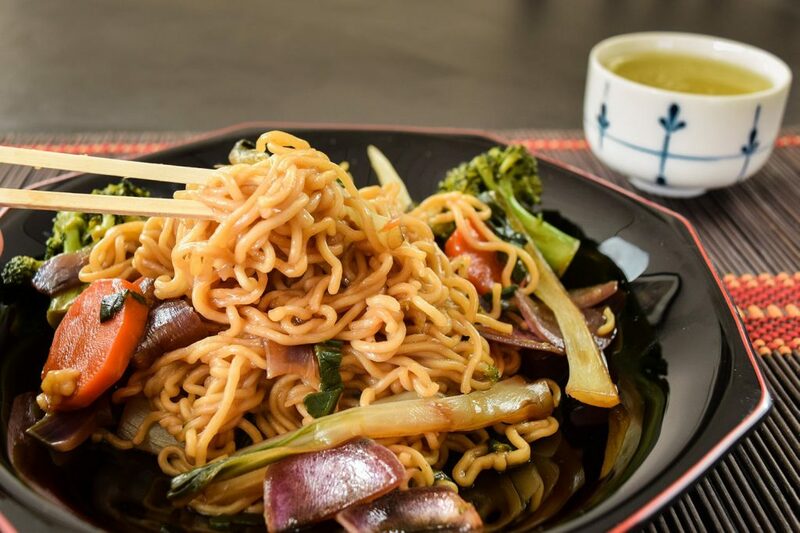 Yakisoba is a fried buckwheat noodle dish that comes with small pieces of pork and a variety of vegetables, usually cabbage and carrots and garnished with aonori (seaweed powder) and pickled ginger. It is not uncommon to see this dish prepared in absolutely massive amounts. It’s quite a popular matsuri (Japanese festival) food. This might be one of the most fun foods to eat in Tokyo, purely because of the atmosphere that is usually provided with a Yakitori shop. Yakitori are incredibly delicious grilled chicken skewers. You can find just about every part of the chicken is used at a Yakitori shop, this falls in line with the Japanese mentality of “Mottainai” which is the belief of not being wasteful. 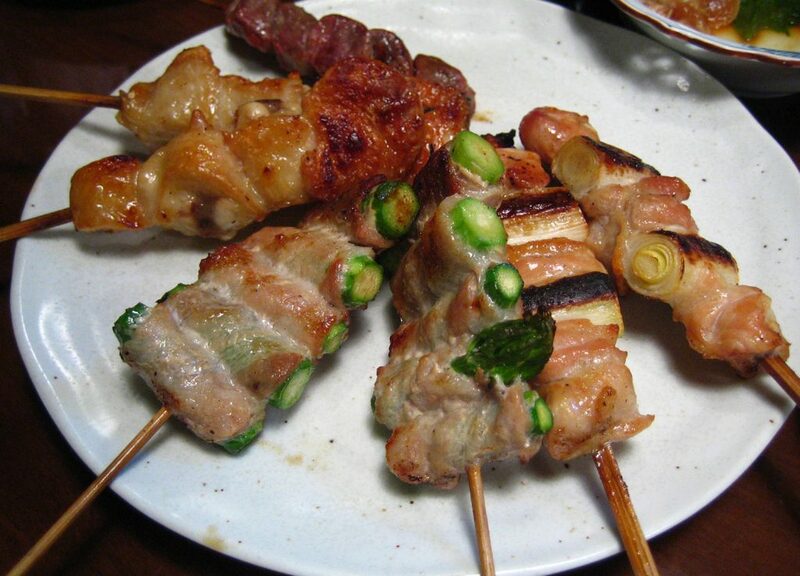 One of the most popular Yakitori sticks is “negima”, grilled pieces of chicken stuck between Japanese green onion. It absolutely delicious and you can not eat just one. The quality of Yakitori can range from street food to Michelin starred. If you’re feeling adventurous you can walk down any “Yokocho” (drinking alley) and grab a seat at a small counter and sit with the locals or you can head to Torikizoku (a large yakitori chain in Japan) which is often times called the McDonalds of yakitori. This one might come off as weird and totally out of left field but Yaki imo, or Japanese Sweet Potato, is incredibly delicious and sweet. This is one of the most eaten foods in winter and my personal favorite dessert in all of Japan. These are very different from the sweet potato we have grown to know. Sold in flatbed trucks with ovens that are constantly stoking charcoal to keep this delicious treats hot and ready. 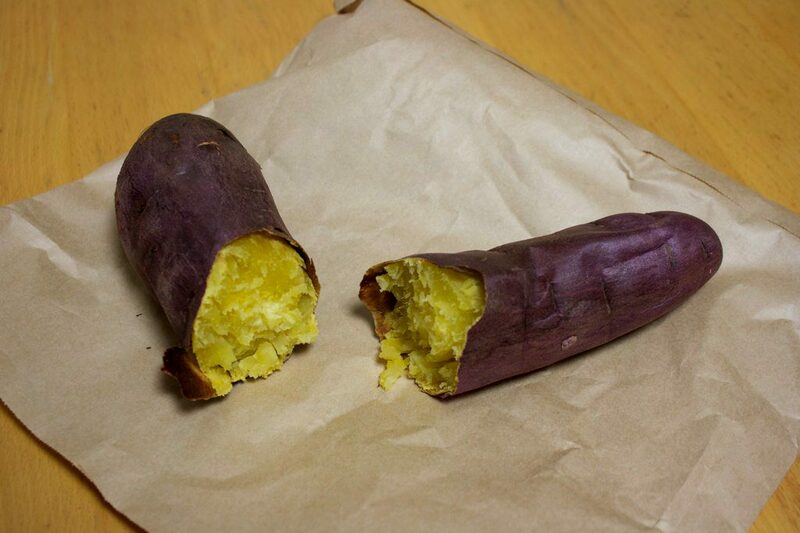 There is always a variety of sweet potato as well, my personal favorite is the deep golden kind, it is unmistakeable from the others. Similar to the ice cream trucks we have grown up with, when you hear the speakers blasting “Yakiimo”, I recommend to run in that general direction and get one for yourself. In addition to the vendors that are around, you can usually find these wrapped in paper bags in front of stores sitting atop warm coals. As someone once told me “Yakiimo is the golden fruit”. This Japanese style omelet is very different from the egg dishes we have come to love. Everything about it is different. It’s square instead of round, it’s thick instead of thin, it comes on a stick (sometimes), and its sweet. Tamagoyaki, in my experience, is a love or hate sort of food. You either love it or hate it. 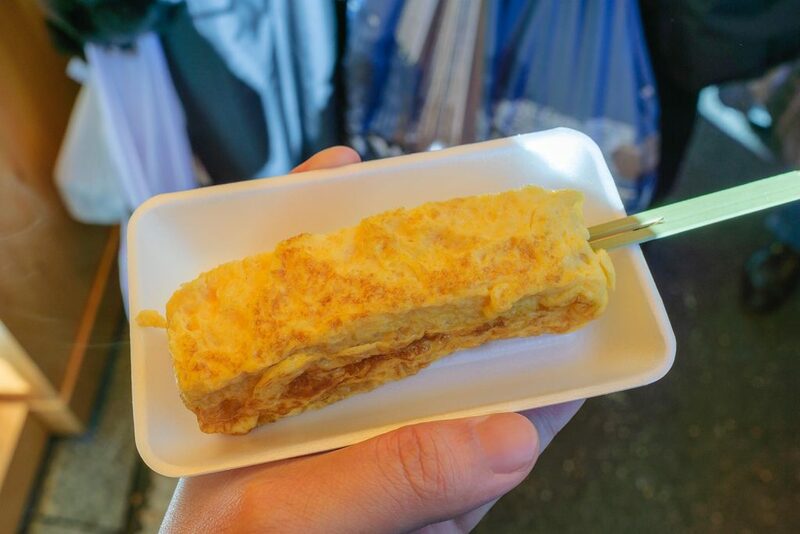 While you can certainly eat Tamagoyaki by itself and at any time, it is often enjoyed as the final piece in a sushi meal. Some people even order it first to see if the chef is up to par! Japan’s take on fried chicken. Karaage is always fried to golden perfection and served with a dollop of Japanese mayo on the side (Seriously, Japanese mayo and regular mayo needs to be differentiated). Karaage comes in a handful of flavors and I’m sure there are some places that get creative with the flavors, but by far the most popular are simply original and Soy sauce. Karaage can be found at just about any restaurant and convenience store, I recommend the 7-11 Karaage stick, they even have a spicy version! There’s even a restaurant called ‘Kara Yama” which means “mountain of karaage”. They pile a plate high, full of fried chicken. It doesn’t hurt that they make some very delicious and very crispy fried chicken. 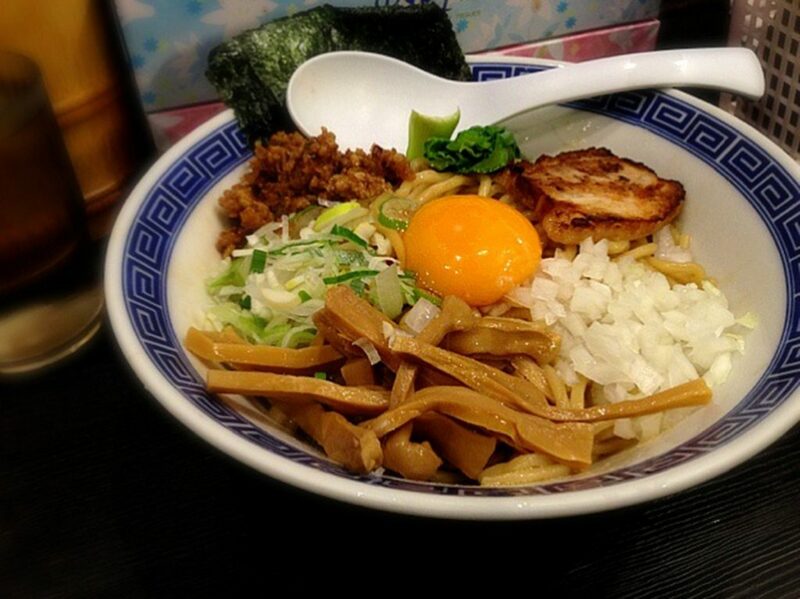 Abura Soba is a form a ramen that has very little broth a lot of noodles. This is gaining popularity in the west with places like Ivan Ramen serving this dish. However, this was originated in Tokyo because of the drastically cheaper cost point it takes to make this. While highly customizable the heart of Abura Soba remains a thick middle served in a bowl with oil and pork fat in the bottom, the key is to mix the noodles up with the sauce! This is often served with a thick chili paste and some form of grilled pork slices or chunks and course garnished with green onion. Unagi, or Japanese Eel, is somewhat of a more luxurious Japanese food because of it’s high cost. However, this can be one of the most delicious Japanese foods you could possibly have. 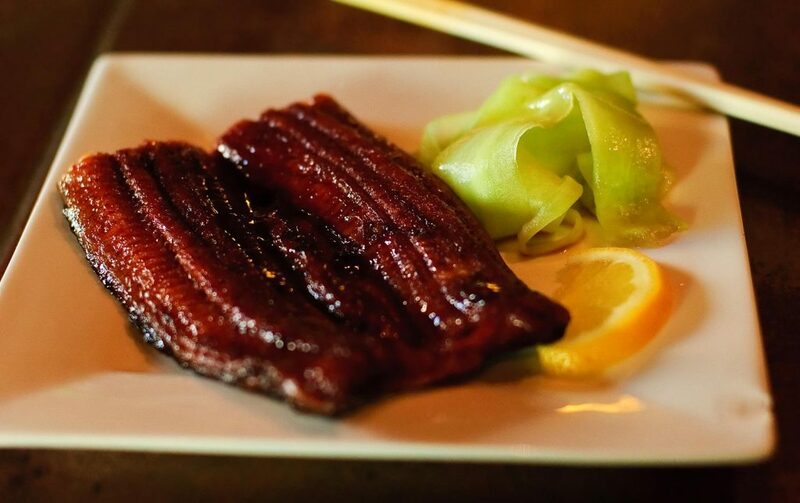 Unagi can be served in a variety of ways including sushi, rice bowls, and even as a sweet bread like pie! Unagi is very high in protein and known for it’s rich and deep flavor. It should be noted that Unagi should be prepared by professionals as the oils in the meat can make it really tough to eat. Just watch some unagi masters carefully and tediously stoke the charcoals to cook the unagi to perfection. It is known that the Shizuoka prefecture is home to the best unagi in Japan. While the cooking process differs from region to region, the most common form is with a sweet glaze that is applied during the roasting process and then served on a bed of steamed Japanese rice. This sauce is arguably as important as the unagi itself so you can bet that the serious restaurants won’t give up their recipe that easily! How would you like to have this delicious Japanese dish prepared? So there you have it, get out there and try some traditional Japanese food you might not have known about! If you wind up eating anything on the list we would love to see pictures of what you got! 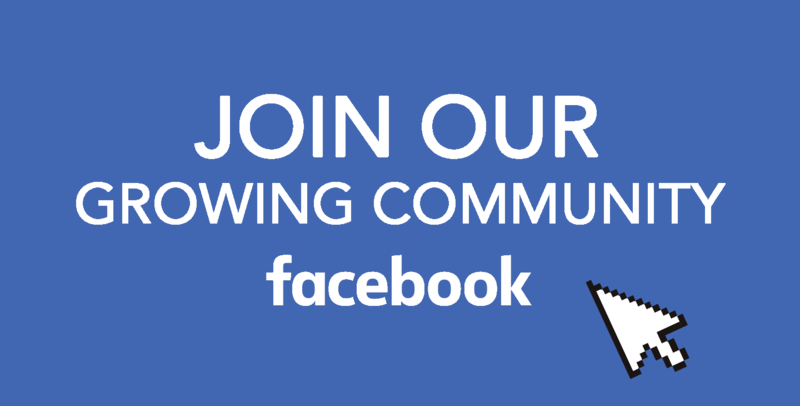 Post them on our Facebook group!